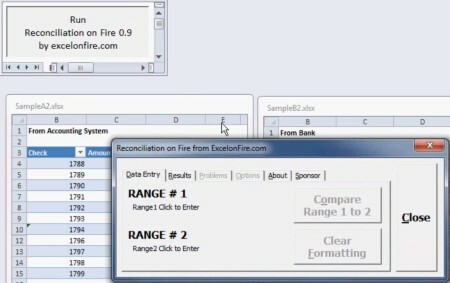 Reconciliation on Fire is a free software to compare Excel spreadsheets. This is a free macro spreadsheet for Excel which allows you to compare data from two different spreadsheets in order to find differences and inconsistencies between the two. This free Excel comparison macro can be used to find typing errors primarily, but also in accounting when you need to go over numbers from two different accounts to make sure that everything’s OK and reconciled. 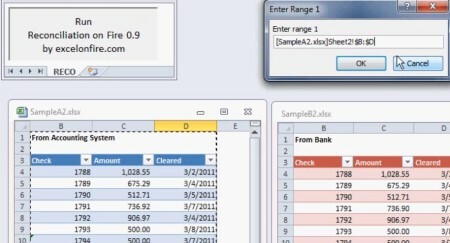 When you download this free Excel spreadsheet comparison utility, the only thing that you’re gonna get when you open up the downloaded spreadsheet is what can be seen in the top left corner of the image above. Single button, which when clicked is going t open up the actual control windows, which can be seen in the bottom right corner. Any range of columns and rows can be compared, they can be arbitrarily set using the Range 1 and Range 2 buttons. Like we said, this free spreadsheet comparison macro will mostly be useful to accountants who are working with large amounts of spreadsheets and data, especially during reconciliation, which is basically a comparison between two different sets of data, like for example bank statement and personal budgeting slip, to see if there are any differences between the two. Let’s see Reconciliation on Fire in action. Similar software: Spreadsheet Compare, Lazar Lookup. 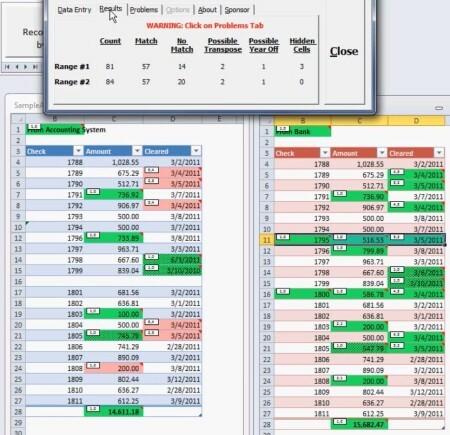 Open up both of the spreadsheets that you want to compare and of course Reconciliation on Fire spreadsheet. Macros have to be activated in Excel, otherwise this free data comparison utility will not work. Click on the Run button, and then fill out both of the ranges from each of the spreadsheets where you need to compare data. Simply left click and drag to cover the range, you should see values change in the Enter Range window. Do this for each of the two sets of data that you’re interested in comparing. When you’re done, the Compare Range 1 to Range 2 button from the main menu will become clickable, click it, and wait for a few seconds for Reconciliation on Fire to do the comparison and find the differences. Reconciliation on Fire is a very powerful tool, which is gonna save you a lot of time that you would normally spend on flipping through spreadsheets looking for differences between them, to make sure that there are no errors. This is just a spreadsheet, there’s no installation, just open and run, which is a great plus. Free download.